Hola everyone! 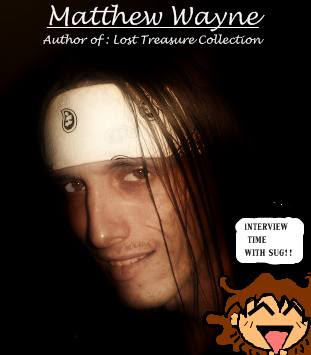 I am doing a special interview with one of my good buddies Matthew Wayne of Texas. I have known him forever and a day and was very happy to hear of his first book being published. He was kind enough to send me a copy for me to read and it is excellent. I am looking forward to his fantasy novel that is in progress. I also would like to share him with all of you as well in hopes that you will pick up your own copy of his first book. Now lets get this interview started. First of all tell us a little bit about yourself? Hm, these types of questions has always been hard to answer. Lets see I was born in Utah, and was moved to Texas when I was still just a child. I am 26, have been writing since I was probably around 15, and even then my controversial style always seemed to either get me in trouble, or cause heads to turn. How did the idea of your book come to be? Over the years of writing I noticed I wouldn't throw any of my literature away, even if they were only one sentence long. Couldn't bring myself to part with them even though they were not complete Sonnet's they still came from a part of my soul. So one day an idea came to me to compile them all together and make a book, out of my incomplete quotes, poems, literature. What inspired you to get your first book published? Mainly to know that I had done it. Then it would have to be for you, and anyone else who wishes to read what I have to offer. Most dead poets would tell you it was never for the fame, or the money as everyone knows most died in poverty. No, my inspiration for getting my first book published was so that I could look back and know I left a mark, whether big or small an imprint into our culture and now history. Will there be more writings and publications in the future? Oh yes, a few more in fact. Currently in the works is a Fantasy/Fictional book "The Legacy of Sky" and another poetry/Literature book that will showcase all of my completed Sonnets, and Tangents. Could you give us a verse from one of your poems and describe to us what inspired it? One of my absolute favorites found within the book is located in chest five. "Can you reach your dreams? or touch your god? a ghostly visage, a desert mirage. sons and daughters of the white coat sage"
This passage has always been easy for me to remember what the inspiration was and still is. In the age of Science we seem to still cling to childish fairytale, like the child's tooth fairy we still grasp for the illusions. Whether its a single tangible god or wishes made by tossing a penny into the fountain, We have truly as a spices fallen from understanding of how this universe behaves, and we have forgotten knowledge that even our ancestors are teaching us today, We are the white coat sages. And finally,How do we go about in getting our hands on a copy of your book? Thank you for inquiring! :) simple really. You can order them online at either Amazon.com or by going here. The online price is currently set to $12.50 this is to help cover the publisher's cost. However if you wish to get a copy for only $10 simply email me at waynecanning@hotmail.com, with the subject line of "Book Order" with your shipping address, and your method of payment. however cannot take credit cards at the moment. Thank you, and hope you all enjoy the read. I will be updating my blog shortly. In the mean time go check out my shop. Thanks again everyone and talk with you soon.